The skid steer loader has often been referred to as the Swiss Army knife of construction equipment — switch out the attachment and you can have a compact backhoe, an auger boring machine, a snowplow or a pallet mover. The industry’s move to standardized attachment interfaces between manufacturers made this all possible. Now, we’re seeing a similar standardization across excavators, which makes for some exciting possibilities. Here are four tips to make sure you’re making the most of your compact excavator. Most equipment manufacturers offer attachment brackets for their excavators, not all of which are compatible with other manufacturers’ attachments. One of the best options for a mixed fleet is to go with a pin grabber-style quick-coupler because it works across a variety of attachments. Compatibility isn’t all in the interface, however. The excavator must be adequately equipped. When evaluating a compact excavator purchase, I’d suggest choosing a machine that has, at minimum, single-acting and double-acting hydraulics to ensure a variety of attachments are compatible. As the component making the most direct contact with abrasive materials, attachments get put through a lot of abuse. Both preventive maintenance and operator training can help avoid many of the most common problems before they occur. You should also keep a healthy stock of replacement hoses, fittings, couplers, wear plates, bucket teeth, hammer tools and pins to ensure an attachment never needs to be taken out of service for too long. I’ve found customers using compact excavators in some pretty unique ways in recent years. Excavators have an advantage over skid steers and compact track loaders in that they have higher reach, greater visibility at heights and a 360-degree swing radius. 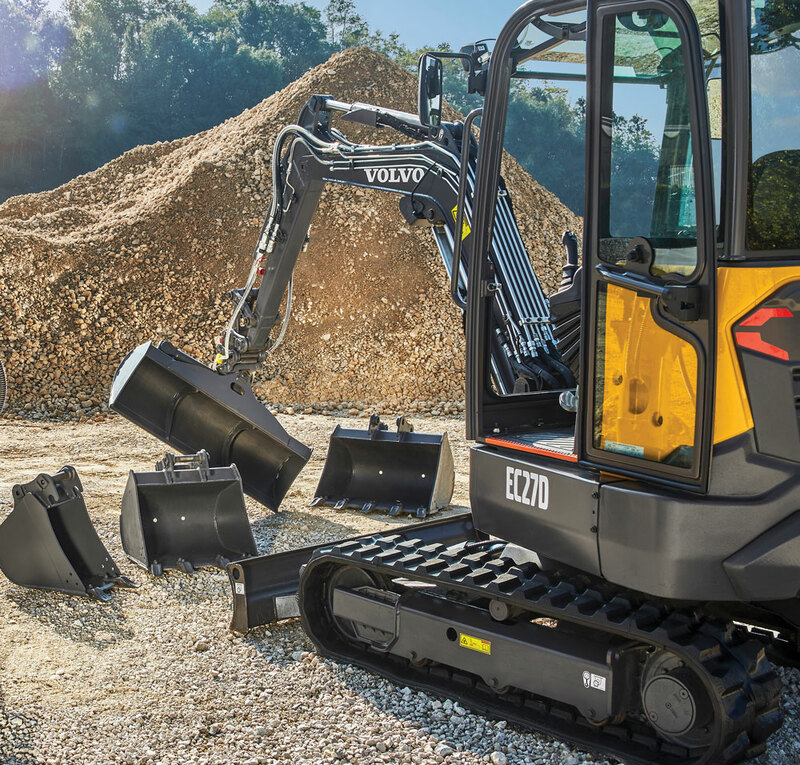 By thinking beyond the essential buckets and hammers and considering excavators as a potential replacement to skid steers, customers may be able to create some significant competitive advantages on the jobsite. Bottom line, by stocking the core group of attachments and interfaces, being prepared for service and having a willingness to think outside the box, a compact excavator owner can find alternate ways of getting the job done more quickly and profitably. John Comrie is the compact excavator product manager at Volvo Construction Equipment.